Narmada Control Authority, a body corporate under Ministry of Water Resources, River Development & Ganga Rejuvenation, Govt. 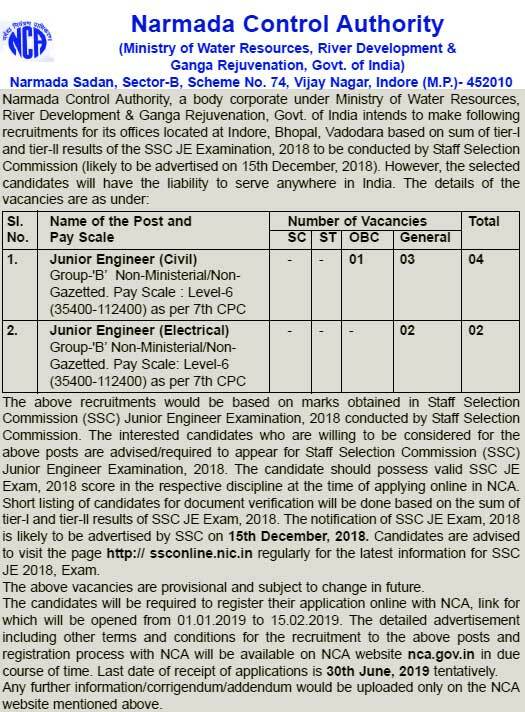 of India intends to make following recruitments for its offices located at Indore, Bhopal, Vadodara based on sum of tier-l and tier-ll results of the SSC JE Examination, 2018 to be conducted by Staff Selection Commission (likely to be advertised on 15th December, 2018). However, the selected candidates will have the liability to serve anywhere in India. The above recruitments would be based on marks obtained in Staff Selection Commission (SSC) Junior Engineer Examination, 2018 conducted by Staff Selection Commission. The interested candidates who are willing to be considered for the above posts are advised/required to appear for Staff Selection Commission (SSC) Junior Engineer Examination, 2018. The candidate should possess valid SSC JE Exam, 2018 score in the respective discipline at the time of applying online in NCA. Short listing of candidates for document verification will be done based on the sum of tier-l and tier-ll results of SSC JE Exam, 2018. The notification of SSC JE Exam, 2018 is likely to be advertised by SSC on 15th December, 2018. Candidates are advised to visit the page http://ssconline.nic.in regularly for the latest information for SSC JE 2018, Exam. The above vacancies are provisional and subject to change in future. The candidates will be required to register their application online with NCA, link for which will be opened from 01.01.2019 to 15.02.2019. The detailed advertisement including other terms and conditions for the recruitment to the above posts and registration process with NCA will be available on NCA website nca.gov.in in due course of time. Last date of receipt of applications is 30th June, 2019 tentatively. Any further information/corrigendum/addendum would be uploaded only on the NCA website mentioned above.